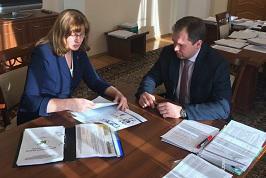 On the 7th of February, 2019 the meeting of Maria A. LIVZAN, OSMU Rector, and Dmitry V. USHAKOV, Vice Chairman of Omsk Region Government, took place. During the meeting the issues of innovation development and pilot projects in public health were discussed. Maria A. LIVZAN noted that OSMU scientists are fully engaged in different international projects, such as “Systems Biomedicine of Parkinson’s Disease”. Dmitry V. USHAKOV expressed confidence that OSMU and Omsk Region Government would cooperate on many important issues.